On Sunday 15th March, members of the Black Caucus attended the Premier’s Gala dinner, organised by the Victorian Multicultural Commission. The event signified the beginning of the Cultural Diversity Week which runs between the 15th and 23rd of March 2014. The dinner event was held at the Palladium at Crown, and hosted a number of different multicultural community groups, over 150 tables. The event was well attended by colourful and diverse members of the Victorian multicultural community, and this was reflected in the music and entertainment for the evening. The proceedings were opened by a welcome to country by Aunty Carolyn Briggs, also known as Aunty Faye, with other speeches by the some distinguished guests. 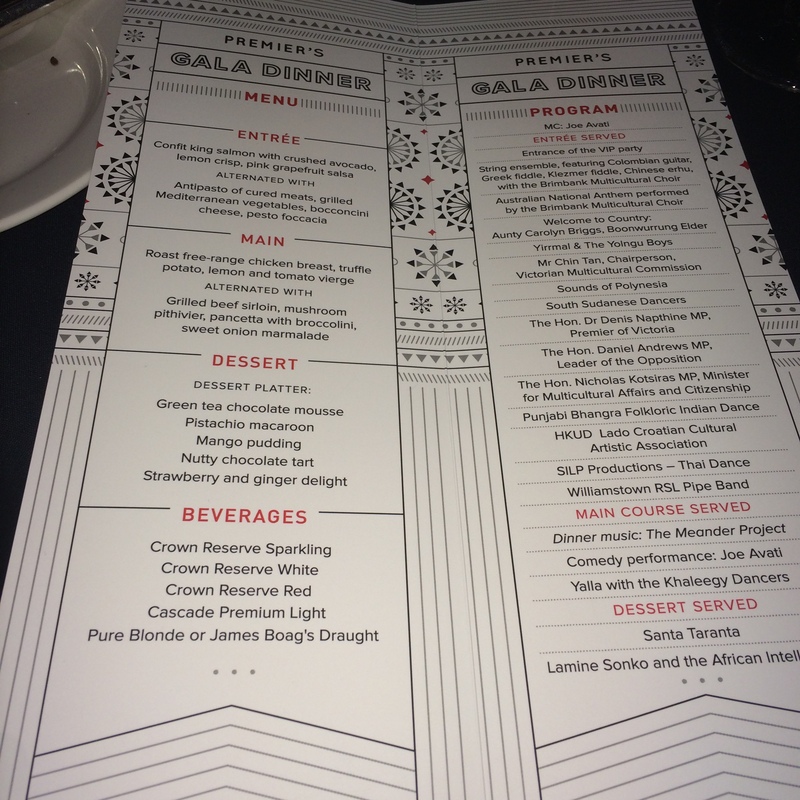 The evening was peppered with everything from a Scottish pipe band to African women’s tribal dancing, from Polynesian dancing to Italian comedians. Guests were invited to have a photo opportunity with the Premier and the leader of the state opposition. Some community members were more than enthusiastic in taking advantage of the distinguished guests. The food was superb, and the wait staff were professional, attentive and welcoming. The evening was rounded off nicely with music from an energetic African band that fired up the dance floor and had us sweating into our tuxedos and ball gowns, making more work for the dry cleaners during the week. A very pleasant night was had by all with carriages just before midnight.